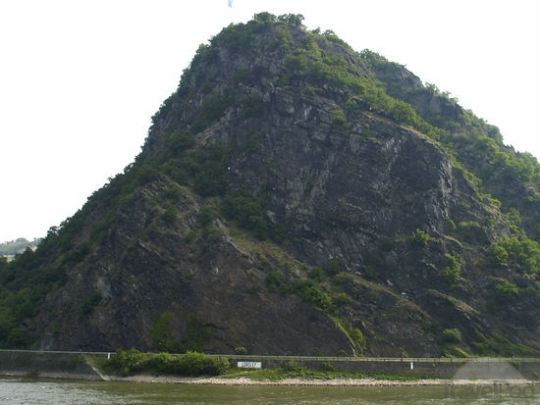 The Lorelei Rock, located at the sharpest, most dangerous bend in the Rhine River, has for ages captured the imagination of those who have gazed upon it – albeit usually out of fear – blaming the alluring song of the “Rhine Maiden” for disasters which include a series of boats pushed by currents onto the rocks lining the river. San Francisco’s emblematic counter-culture group, Jefferson Airplane/Starship, were to perform there once in the summer of 1978 at the open amphitheater behind the Lorelei. Then, disaster struck. Lead singer Grace Slick (Somebody to Love, White Rabbit ) refused to appear, maybe too sick, probably too drunk. The concert was cancelled and the gathered audience erupted in fury, throwing bottles, setting fire to the stage, and destroying all instruments and equipment. The curse of the Rhine Maiden had struck again and the group never recovered.